For far too many women, this is the reality. Millions of workers nationwide are signing away all their rights to get justice if they are sexually harassed, have their wages stolen by their boss or suffer a host of other abuses. And they have no choice in the matter. It’s called forced arbitration. An agreement buried in the fine print of your paperwork that the employer forces you to sign to get a job. It’s a rigged system that needs to be reformed. Yesterday at the State Capitol, Assemblywoman Lorena Gonzalez Fletcher (D-San Diego) announced legislation to end the practice of employers forcing workers to waive their rights as a condition of employment. AB 3080 would protect workers from discrimination, harassment, stolen wages and other exploitation. It would shatter the silence women are forced to endure. And it would put an end to a coercive practice that big corporations increasingly use to strip workers of basic rights. Nobody should be forced to sign away their rights as a condition of taking a job. Countless people don’t have the luxury of picking and choosing what job to take. They’re just trying to make ends meet. That’s why these forced arbitration agreements are so exploitive. Gonzalez Fletcher also announced yesterday that she has asked the Assembly Speaker’s Office to issue subpoenas that would enable victims of workplace abuse to speak openly about their cases without violating the terms of their arbitration settlements. That’s how royally screwed up this system is. The only way workers who want to tell their stories are able is through the extraordinary measure of the state legislature issuing a subpoena – something it hasn’t done since the Enron investigation in 2001 – to testify about the coercive, secretive nature of forced arbitration. And the problem is getting worse, not better. New research shows the negative ramifications of forced arbitration disproportionately impact women and people of color. Working people deserve access to justice in our court system to hold employers accountable to the law, but mandatory arbitration locks them out of court and creates a barrier to pursuing justice. We will only see a fair economy and a reduction in the widening gap of income inequality when workers have the right to engage in collective action in any forum to enforce their basic rights to be treated and paid fairly on the job. This legislation is a top priority for the California Labor Federation, the sponsor of the bill. When workers stand together in a union, we are able to shift the power balance so that these kinds of abuses don’t happen. But for non-union workers who are forced to sign these agreements, justice is out of reach. That’s why California’s unions have taken on the issue. It’s a matter of fundamental justice for all workers. Working people have spent decades fighting for the strong laws California has in place to protect workers from workplace abuses. 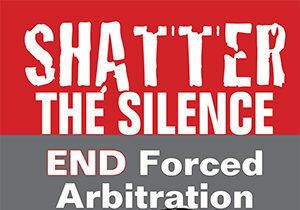 All worker protections are at risk due to the rise in forced arbitration. Thousands of women and low-wage workers are experiencing harassment, wage theft and other abuses on the job without any recourse for justice. AB 3080 ensures no worker is forced to waive her rights as a condition of getting a job. It’s time for the legislature to act to shatter the silence so many women are forced to endure because of this rigged system. Joining yesterday’s announcement in support of the bill was 2017 Time Person of the Year Susan Fowler, one of the silence breakers who ignited a movement. Fowler, the former Uber executive who blew the whistle on a culture of sexual harassment at the company, has become a leading advocate nationwide to stop the practice of forced arbitration agreements. She penned an op-ed in last week’s New York Times about the need for the #MeToo movement to tackle forced arbitration. Harassment, discrimination, and retaliation are all illegal, but there was no path for justice for me or my coworkers. As a condition of employment, Uber had forced us to sign away our constitutional right to sue them in court. I had only one option left: to become a whistleblower, to put my job, my career, my reputation, and my relationships with friends and family at risk by speaking out. It was a risk that many of my coworkers could not afford to take. It was the only option I had left. This should never happen again. If we’re serious about combatting sexual harassment and other abuses in the workplace, AB 3080 is a great place to start. The legislation was approved by the Assembly Labor committee yesterday and now heads to the Judiciary Committee next week.